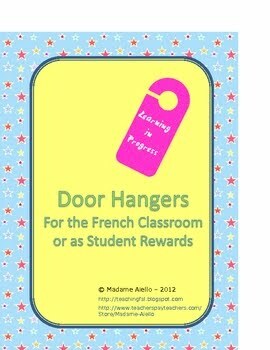 Use these cute door hangers to decorate your French classroom, to indicate what learning activities are going on inside, or to communicate you've taken the class outside to work on a sunny day. There is also one which can be used as a prize, reward or gift for students, which can be personalized for their rooms at home. If you like these, I'd love for you to leave a comment to let me know. You can get more in my product called More French Door Knob Hangers.